Coupon or discount codes are assigned to affiliates to credit them with a commission for each purchase the code is applied to. One or more codes can be assigned to an affiliate. In the following we describe the details on how this is done. 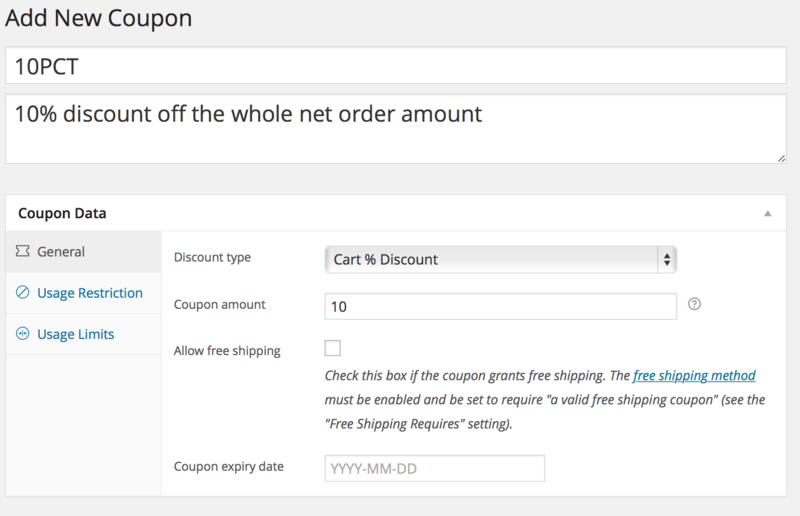 Create a coupon code in your shop, go to WooCommerce > Coupons > Add Coupon to specify the coupon code and determine its parameters. Let’s assume the code you have created is 10pct granting a 10% discount off the whole net order amount. For Events Manager Pro, go to Events > Coupons Manager and click on the Add new button. For Gravity Forms, go to Forms > Coupons and click on the Add new button. Go to Affiliates > Manage Affiliates and click the edit symbol for an affiliate. Under Affiliate Attributes, click New Attribute, then select Coupons as the attribute key and indicate the coupon code (for example 10PCT) as its value. Hit Add and the code is now assigned to the affiliate. Now, on any purchase that the code is applied to, the related affiliate will be granted a referral, just as if the customer had made a purchase through the affiliate’s link. Multiple coupon codes can be assigned to an affiliate. Edit the existing Coupons attribute and separate codes by comma(s). The same coupon code can not be assigned to more than one affiliate. This will display the coupons that are assigned to the affiliate who is viewing the page. The integration must support coupon codes and any code assigned to an affiliate must have been created and be valid in the shop. 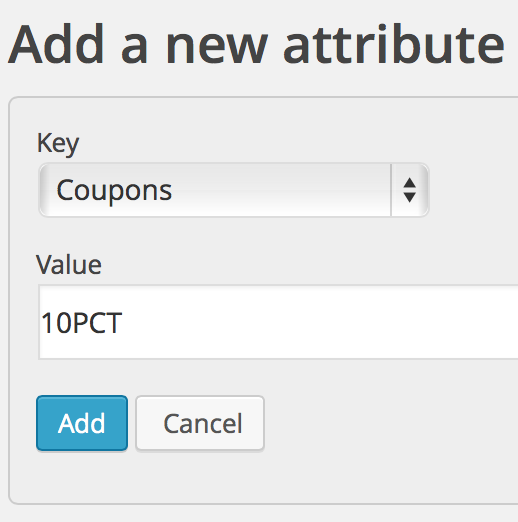 To assign a coupon code to an affiliate, edit the affiliate, then add a Coupons attribute. You can add one or more coupon codes, separated by comma. Any coupon code can only be assigned to one affiliate. Coupon codes assigned to affiliates will override affiliate links: If a coupon code is applied to an order by the customer and the coupon code is assigned to an affiliate, a referral will be granted to that affiliate. This applies even if the customer has visited the affiliate link of another affiliate before. If coupons corresponding to different affiliates are applied to an order, there will be as many referrals and the base amount taken to calculate the referral amount will be split equally. Assuming a 10% referral rate for affiliates in general and a net order amount of 100$ with a coupon code applied granting 20% off the net order amount. The net purchase amount will be 80$ and the affiliate will be credited with a 8$ referral. Assume a 10% referral rate in general and a net order amount of 500$ after coupons A and B applied. Coupon A belongs to affiliate X, coupon B belongs to affiliate Y. There will be 2 referrals, one for affiliate X, another one for affiliate Y, each referral will credit the affiliate with 10% of 500$ split equally so that affiliate X gets a referral of 25$ and so does affiliate Y. Note: Coupons were also supported in Affiliates Ecwid but with Ecwid version-dependent API changes, it is currently considered deprecated.